1.First of all, make sure that a network is connected between your PC and your target. A cross cable if connected directly between your target and your PC, a network cable if connected via a network switch or hub. 2.Check if the Target is connected and is powered on. 3.Check if the led's at both network connections are on (is the network cable inserted well?). 4.Check with your network administrator of system administrator that the network is not blocking traffic between your PC and your target. Turn-off your firewall temporarily to check if this is the problem. 5.If multiple networks are connected to your PC, disable all networks that are not connected to your target. 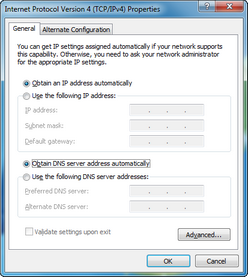 6.If no DHCP server is used, the target will fallback on the automatic private address of 169.254.254.254. 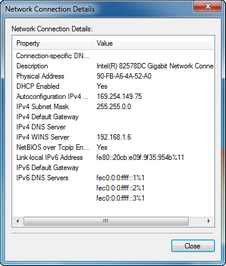 Make sure the network interface on the host pc has a network IP-address in the same range. If all conditions are met but 20-sim 4C does not find an IP-address you can try to use a cross-cable to connect the target with your PC. 1.First of all, make sure that a cross cable is connected between your PC and your target. A cross cable if connected directly between your target and your PC, a network cable if connected via a network switch or hub. 3.Open the TCP/IP Properties of your connection. 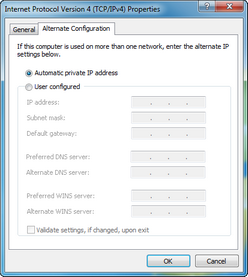 Go to Windows Help and search for "configure TCP/IP settings" to find out how you can open the TCP/IP Properties. 4.Make sure the following settings are chosen. The proper settings for the TCP/IP properties of you connection. 5.Open the Local Area Connection Status window of your connection. Go to Windows Help and search for "local area connection" to find out how you can open the Local Area Connection Status window. The status of your network adapter should look like the figure below. The status of your network. Do not worry about the warning. Windows will try to obtain a automatic private address. This may take some time (1 minute in some cases) before the connection is established. 6.Click on the Details button. If the private address was obtained successfully the IP address should be in the range 169.254.x.x. 7.Close all network windows and return to 20-sim 4C. •Turn-off your firewall temporarily to check if this is the problem. •Close all other network connections (do not forget your wireless network) to check if this is the problem. 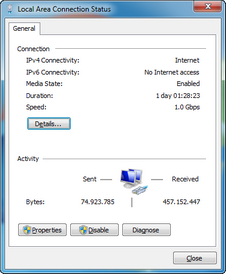 •Enter the IP address 169.254.254.254 manually in 20-sim 4C. The Windows firewall message when the Refresh button is clicked. You should allow 20-sim 4C access to the network to find the connected targets. If you do not allow access, the correct IP-address can not be shown. 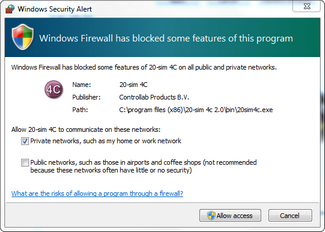 1.Click the Allow Acces button (or a similar button if another firewall message is shown) if the name of the program is 20-sim 4C and the publisher is Controllab Products B.V.
2.Please contact your network administrator if the name of the program is not 20-sim 4C or the publisher is not Controllab Products B.V.
3.Please contact your network administrator if you do not have permission to change the firewall settings. 1.Switch the power on of your target. 2.In 20-sim 4C click on the Configure button. 3.In the Configure Target tab, Click the Discover button. 20-sim 4C will now start a search to find the IP-addresses of connected targets. After a few seconds the search is ready and a list of targets is shown. Select the target that you would like to use. 4.Select your target and click OK. In most networks, IP-addresses are automatically assigned. In most networks, once an address is assigned, it will stay the same. If you are not sure about the assignment of addresses in your network, please contact your network administrator.